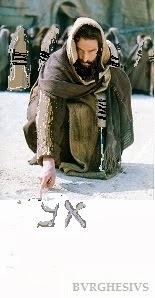 Jewish Jesus - Art Exhibit: Jesus teaching the secrets of the Aleph Bet, drawing the Aramaic letters "AV" in the sand. Jesus teaching the secrets of the Aleph Bet, drawing the Aramaic letters "AV" in the sand. The Hebrew letter "Bet" represents two different phonemes: a "b" sound (/b/) (bet) and a "v" sound (/v/) (vet). The two are distinguished by a dot (called a dagesh) in the centre of the letter for /b/ and no dot for /v/. Here Jesus is writing the Aramaic Aleph and Vet. Aleph is the first letter of the Aleph-Bet and represents the number One. It is the Beginning of the Aleph-Bet. It is a symbol of both Unity and the Infinite. The Infinite Source and Beginning. Bet, is the second letter of the Aleph-Bet and represents the number Two, and means "house" or container. Taken together these 2 letters mean "Father" on one level, the Aleph-Bet, the 22 letters of the Hebrew and Aramaic Alphabet, and also signify the Unity and Infinite Source that is contained in all things. VI. 1 Now a certain teacher, Zacchaeus by name, stood there and he heard in part when Jesus said these things to his father and he marvelled greatly that being a young child he spake such matters. 2. after a few days he came near unto Joseph and said unto him: Thou hast a wise child, and he hath understanding. Come, deliver him to me that he may learn letters. And I will teach him with the letters all knowledge and that he salute all the elders and honour them as grandfathers and fathers, and love them of his own years. 3 And he told him all the letters from Aleph even to Tav clearly, with much questioning. But Jesus looked upon Zacchaeus the teacher and saith unto him: Thou that knowest not the Aleph according to its nature, how canst thou teach others the Bet? thou hypocrite, first, if thou knowest it, teach the Aleph, and then will we believe thee concerning the Bet. Then began he to confound the mouth of the teacher concerning the first letter, and he could not prevail to answer him. 4 And in the hearing of many the young child saith to Zacchaeus: Hear, O teacher, the ordinance of the first letter and pay heed to this, how that it hath lines, and a middle mark, which thou seest, common to both, going apart; coming together, raised up on high, dancing, of three signs, like in kind, balanced, equal in measure: thou hast the rules of the Aleph. Aleph in Jewish mysticism represents the oneness of God. The letter can been seen as being composed of an upper yud (Yodh), a lower yud, and a vav (Waw (letter)) leaning on a diagonal. The upper yud represents the hidden and ineffable aspects of God while the lower yud represents God's revelation and presence in the world. The vav ("hook") connects the two realms. In the Aleph is hidden the mystery of the 3 in One : The ordinance of the first letter : it hath lines, and a middle mark, which thou seest, common to both, going apart; coming together, raised up on high, dancing, of three signs, like in kind, balanced, equal in measure: thou hast the rules of the Aleph ! Vav vav is how you spell hook. Why 2 vav and not just one ?